Brain cancers accounts for 1.8% of all cancers worldwide (1). The number of new diagnoses made annually is 2 to 3 per 100,000 people in the US and Europe. Brain and other CNS tumors are the 11th most common cancer in the UK, accounting for 3% of all new cases (2). 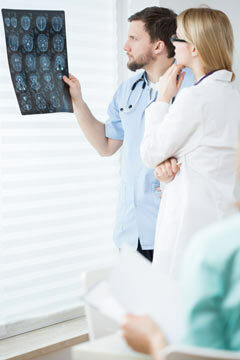 Primary brain tumors are a varied group of both benign and malignant tumors. There are over 120 types of brain and central nervous system cancers. Some tumors are often given a grade to signify the rate of growth (3). Grade I is classed as the least malignant with grade IV being classed as the most malignant. Glioblastoma Multiforme (GBM) is the most aggressive type of brain tumor. The average lifespan of patients diagnosed with GBM is between 12-18 months, with less than 10% surviving at 5 years. The survival for low-grade gliomas ranges from 7 to 14 years (4). The treatment of brain cancers generally involves a multifactorial approach of surgery followed by chemotherapy with or without radiation therapy. Conventional treatment options for GBM are more regarded as palliative and rarely curative due to their aggressive nature. Likewise, complete surgical resection is often impossible due to GBM’s ability to infiltrate normal brain tissue. Due to this, other types of treatments are being looked at to help with the overall prognosis of these types of cancers. The way in which cancer cells work in the body are very different to that of normal cells. Namely, cancer cells have been shown to exhibit an altered metabolism. Compared to normal cells, cancer cells appear to have a greater glucose uptake, even when oxygen is present. Certain tumors function and thrive purely on glucose. This phenomenon was first coined by a biochemist known as Otto Warburg. He hypothesised and proposed the theory that cancer was a metabolic rather than a genetic problem (5). Whilst it sparked criticism then, it has generated new interest with it being coined “The Warburg Effect”. Oncologists can use position emission tomography (PET) scans to locate glucose dependent cancers. These scans allow them to detect where the highest amounts of glucose are being used. Further to this, cancer cells exhibit alterations in mitochondrial metabolism due to increased oxidative stress (6). However, like with the data we have for its use in epilepsy, the action of the ketogenic diet and its anti-tumor effects are likely to extend beyond just the lowering of blood glucose. 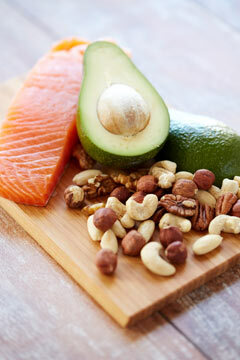 The ketogenic diet not only lowers glucose but also insulin levels in the body. Insulin signalling molecules (including IGF-1, IGF-1R and C-Peptide) and pathways (akt/mTOR and Ras/MAPK) have all been linked to increase cancer risk and promotes the development of cancer cells (8). Ketone bodies have been shown to be toxic to cancer cells whilst the cells also showing a decreased level of key ketolytic enzymes (9). Ketone bodies themselves are active signalling metabolites and have demonstrated neuroprotective properties in other brain disorders such as Alzheimer’s Disease and Parkinson’s Disease (10). 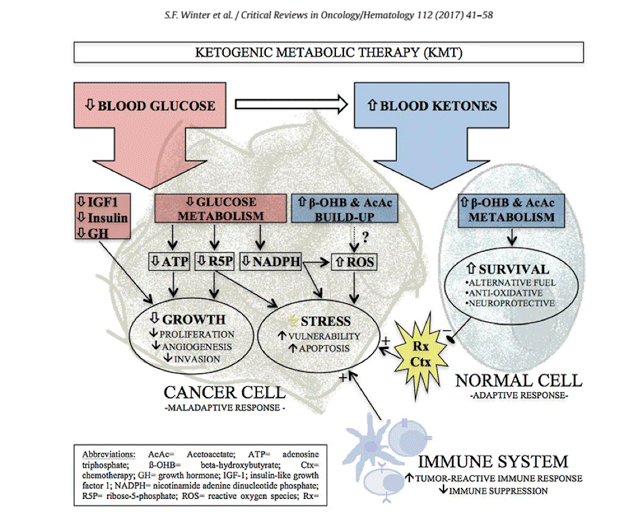 As such, another mechanism for the ketogenic diet working within brain cancer is the ability of the ketone bodies to enhance the protection of healthy central nervous system (CNS) from cancer growth (11). Much of the evidence that we have right now for the ketogenic diet in brain cancer is that of animal and cell culture data. However, there are now small retrospective case studies that have been looked at in humans, with some pre-clinical work now under way. A recent systematic review (12) analysed all the current evidence on the use of the Ketogenic Diet in brain cancers. In it they conclude that the literature available and preliminary results from ongoing trials, suggest the safety and feasibility of the ketogenic diet in GBM’s. They do highlight that the clinical application i.e. the amount of evidence we have in humans, is limited and therefore should be interpreted with caution. The first ever trial looking at the ketogenic diet in brain cancer was carried out in 1995 (13). The study placed 2 young girls on an MCT ketogenic diet (where above 50% of the calories come from MCTs) and followed them for a total of 8 weeks. PET scans revealed a 21.8% average decrease in glucose uptake at the tumor site in both patients. A case report of a 65 year old woman diagnosed with GBM describes her experience of following a classical 4:1 Ketogenic Diet (fat/ protein + carbohydrates) with calorie restriction (600 kcal per day) (14) . She followed this dietary approach for 14 days and then started radiation and chemotherapy treatment. At 2 months, no evidence of either tumor nor associated oedema was apparent and PET scans revealed no recurrent disease. A retrospective study looked at 53 patients with high grade GBM’s being treated with chemoradiotherapy and adjuvant chemotherapy (15). Of the patients, 6 underwent a ketogenic diet during their standard treatment. The diet appeared to be well tolerated and safe, with 4 patients still alive at 14 months follow up. A pilot study from Germany looked at the feasibility of the ketogenic diet in 20 patients with recurrent GBM (16). In this study patients could eat up to 60 grams of carbohydrates per day and there was no restriction on calorie amount. The patients were followed up at 6-8 week intervals. The study could show that the ketogenic diet was safe and relatively well tolerated. 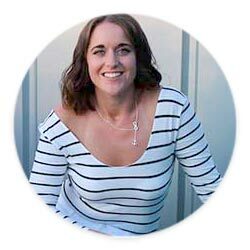 Three patients dropped out as they found it too difficult to stick with the diet and only 12 of the patients left could reach a ketogenic state. No severe toxicity or serious diet-related adverse events were identified though. What Ketogenic Approach Should be Followed? Since the studies that we have are limited in humans, it means the optimal ketogenic diet to follow for maximal therapeutic benefit is still not known. Many of the mice and cell culture studies have used a classical 4:1 Ketogenic Diet (17, 18). As we know though, this diet for adults to follow can be difficult to achieve and importantly maintain. Likewise, it can bring about some adverse reactions and so proper clinical monitoring is required. A study from the John Hopkins Adult Epilepsy Diet Centre, looked at a group of adults who had been following the Modified Atkins Approach (19). 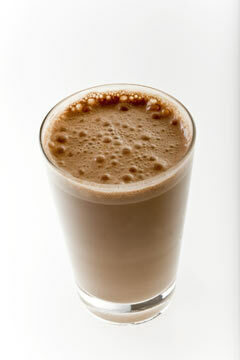 This approach restricts carbohydrate intake to 20 grams per day with no restriction on calorie or fat content. The centre identified 8 patients following the dietary approach of whom 7 remained on the diet when they were followed up at 13 months. Overall the diet appeared safe and well tolerated with around 50% of the adults reporting a reduction in the seizures they were experiencing due to their tumors. One proposed combination therapy is that of the MAD and intermittent fasting. Given the benefits that appears to arise from extended periods of fasting in cancer risk (20) and the difficulties of following the classical ketogenic diet; following the Modified Atkins Approach with intermittent fasting may offer superior therapeutic potential. Whilst the ketogenic diet may appear to have strong therapeutic potentials for the use in cancer treatment, most of the studies shows this in combination with standard care. Predominantly all the data presented in this article utilised the ketogenic diet along with other treatment options. One benefit that appears to be occurring with the ketogenic diet and that of standard care is the diet can help mitigate some of the side effects normally caused. Whilst also helping to enhance the anti-tumor effects of radiation and chemotherapy (21, 22). As well as the ketogenic diet being studied alongside that of standard care, there are other treatment options now being looked at in combination. 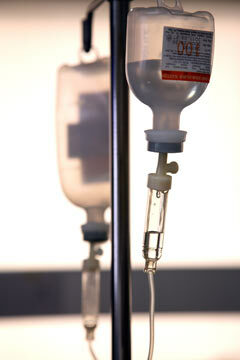 Due to the nature of rapid growth with cancer cells, tumors quickly exhaust the oxygen supply from the blood vessel. This creates a state known as hypoxia. 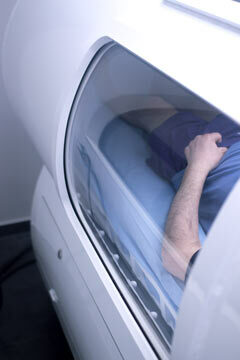 Hyperbaric Oxygen Therapy (HBO2T) saturates tumors with oxygen again and can help to reverse this hypoxia. Whilst HBO2T alone has not been shown to offer great improvements in cancer development, combining it with the ketogenic diet appears to produce significant anti-cancer effects in animal models (23). Another specific area of interest is the use of ketone ester supplementation. Over the past few years there have been several companies that have been developing ketone esters and salts to artificially raise ketone levels in the body. It has been proposed as a potential therapy option within cancer as this population group are known to have difficulties with eating especially when going through active treatment. Being able to artificially raise ketone levels without having to rely solely on diet may therefore be a novel approach to get the body into ketosis. Administration of ketone esters in animals have shown anticancer effects, independent of glucose levels (24). Likewise, the use of the ketogenic diet, HBO2T and ketone supplementation all in combination has shown a more powerful effect on cancer cell death and overall survival rates than when used individually (25). Whilst the animal and cell data as well as preliminary clinical data appear to show the ketogenic diet offering a therapeutic potential in brain cancers, this needs to be interpreted with much caution. Firstly, most of the studies that have been done are within animal models. The diet administered to them have been of the most strict, classical ketogenic diet form and so adherence may not be as good in adults if this is the diet that needs to be followed. There is a small amount of data in individuals following the Modified Atkins Diet which may offer better adherence rates but perhaps not be as effective. Likewise, much of the data we have has also administered the ketogenic diet alongside calorie restriction. This means that as well as following ketogenic principles, a calorie restriction of 600 kcal/day has been put in place. Again, this has mostly been looked at in animals so translation to humans may not be achievable for all. Cancer is an extremely complex disease. We still do not fully understand all the mechanisms happening with the ketogenic diet within cancer cells. Whilst the theory of the Warburg Effect appears to be gaining traction, we cannot say that this is the only reason for the ketogenic diet having an impact; needless to say like with cancer, it is and will be much more complex than this. Perhaps the major point that also needs to be emphasised with all of this though is that the ketogenic diet should not be a standalone treatment. To date, most of the work, especially the human data we have, has all been done in combination with standard care. Whilst the ketogenic diet may appear to be a useful tool, it is just that, a tool. Until there are more robust, clinical trials carried out, we cannot say that it offers a cure nor should it just be used on its own. The other novel therapies that are being studied are also at the very early stages. Much more needs to be understood about their long-term use and combination with the diet before giving a definitive answer on their safety and efficacy in humans. Currently there are 10 trials listed at Clinicaltrials.gov that are looking at GBMs and the ketogenic diet within humans (26). This will allow the development of more robust data to help answer some of the pressing questions that remain within this topic. 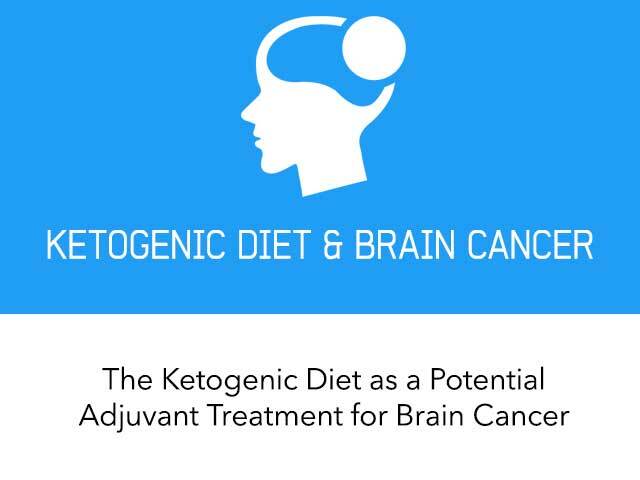 In summary, the ketogenic diet does appear to be useful adjuvant to treatment for brain cancer. However much more clinical work and human studies are still needed in order to fully understand it’s mechanisms, long-term safety and overall efficacy. Thank you for sharing this information. My husband is currently doing the keto diet after having a GBM returning for a 4th time. We are very passionate in promoting preventative care through our ongoing research and findings throughout this entire experience. We are determined to fight this in every way we can and let him beat the odds to show other fighters there is hope through something as simple as making a lifestyle change through nutrition and how you can starve the cancerous cells. If you have any information on how my husband can possibly be apart of the research as proof that the keto diet works, we would appreciate any direction you may have to help showcase the positive statistics, giving more people hope who are suffering this terrible disease. Thank you so much for your comment and sharing your husbands journey. Unfortunately I do not have any direct routes into research access but it may be worth contacting Dr D'Agostino and his lab who specialise in ketogenic research and cancer.